They are like fraternal twins with features in common, but totally different looks. 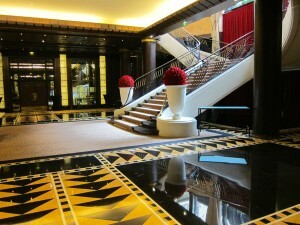 As to similarities, both hotels sit in the spiffy Eighth Arrondissement of Paris, a short stroll to the Champs Elysées. Both are relatively new or newly recreated and boast five star designations. 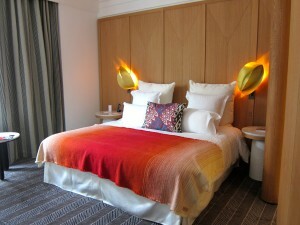 Both offer comfortable, luxurious stays at rates less than “palace” hotels and both wear divine, design-rich decor. That said, each hotel sports a unique personality. One is large and multi-purposed; the other small and intimate. One reflects the glamour and sophistication of 1930s Paris; the other couldn’t be more 21st century, au courant contemporary. 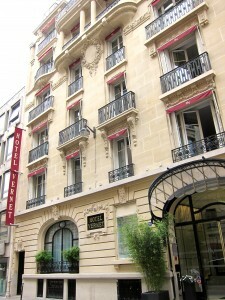 Located at 51-57 rue de Courcelles, the seven story L’Hôtel Du Collectionneur contains 478 rooms and suites; a full service spa; an elegant restaurant; a chic bar; a large central garden; a slew of meeting rooms and event venues; and an “executive lounge,” available to those staying in certain rooms and suites. 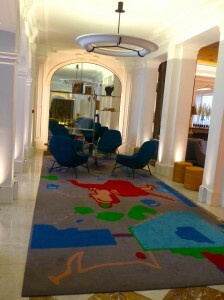 Built in 2004, the hotel operated under the Hilton banner as the Hilton Arc de Triomphe until the owner, Albert Cohen, reclaimed the property in 2012. 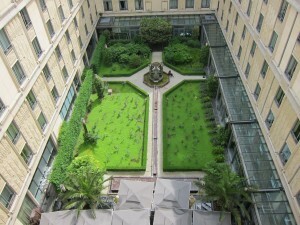 One might think that the Hilton image and prior business focus would linger, but au contraire, Cohen swept away all remnants of the chain and polished the property to a brilliance. Today, the hotel is a member of the prestigious Preferred Hotels & Resorts brand, which represents distinctive properties around the world, and it’s glamour is reflected in two intertwining themes of the 1930s: transatlantic liners and Art Deco. 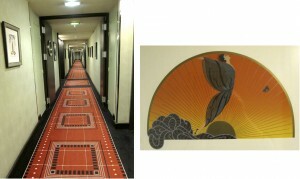 One sees the ocean liner motif represented in architectural details throughout the hotel. 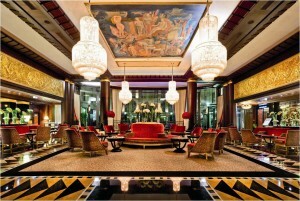 As to Art Deco, it shows up everywhere—even in the hotel’s new name. The hotel’s decorators filled both guest rooms and public spaces with Art Deco objects and artifacts, some original, others reproduced. Of special interest are custom-made items that designers created for the hotel using contemporary materials and authentic designs. 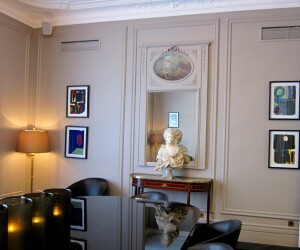 L’Hôtel Du Collectionneur appeals to a wide variety of travelers for a ton of different reasons. 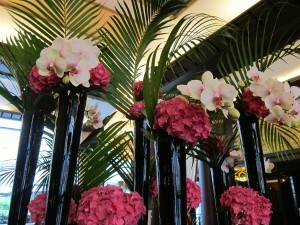 Groups like the lovely lobby, accommodating staff, well-appointed rooms and bountiful buffet breakfast. 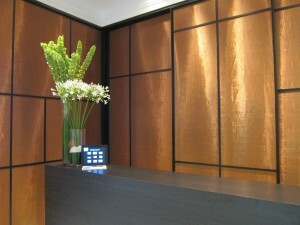 Business people like the free Wi-Fi, the business facilities, the knowledgeable and accommodating concierge. 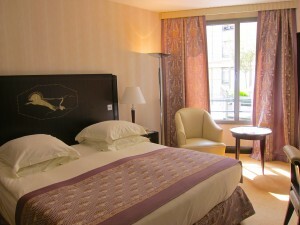 Families like the the connecting rooms as well as the kid-friendly promotions and programs. And sophisticated leisure travellers like the Deco decor; the great bouquets of flowers filling lobbies; the room amenities; the user-friendly bathrooms; the breakfast, snack and cocktail service in the executive lounge;….well…let’s cut to the chase…most guests like everything. 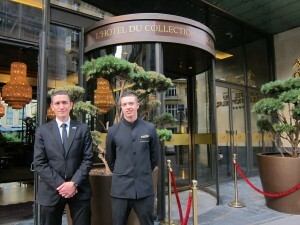 Three words to describe the vibe of L’Hôtel Du Collectionneur: graceful, artistic, multidimensional. One certainly can’t tell from looking at Hôtel Vernet from the street that inside would yield such light,bright contemporary pizzaz. It’s only after walking through the glass doors at 25 rue Vernet, and standing for a moment in the lobby, for the juxtaposition of old and new to reveal its magic. 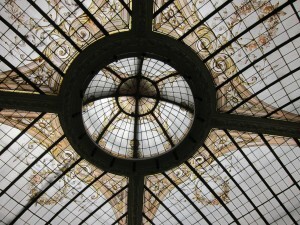 Built in 1913, the structure functioned as a traditional hotel until Besse Signature Group (a family-owned French company specializing in design hotels) bought the property in 2013. 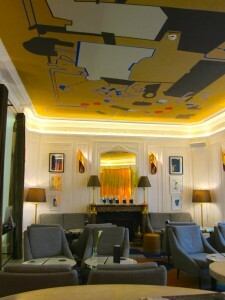 The savvy new owners hired famed interior designer François Champsaur to reinvent the space and the result is striking. Elements of the original structure remain intact. Marble floors and lobby colonnades, high ceilings, a majestic skylight designed by Gustave Eiffel and stained-glass windows in a curving stairwell provide an elegant frame for the new decor. With 50 rooms and suites and public space limited to a discreet reception area, several salons plus a bar and restaurant, the property retains an intimate air. Staying at the hotel feels like staying in the private home of a wealthy grande dame who let her hipster, art-loving grandchild move in and take over. Contemporary art fills the hotel, showing up here, there, everywhere—in carpets and ceiling frescos—in framed prints hanging on mirrors and walls—in pleated copper screens and inventive lighting fixtures. 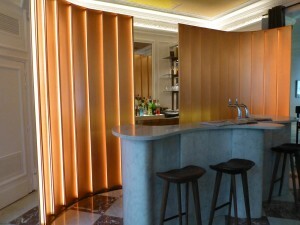 The undulating bar seems sculpted from a slab of marble. 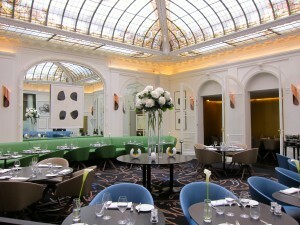 Blue and green dining banquettes circle the hotel’s restaurant, drawing guests into sacred space of color underneath Eiffel’s stained-glass dome. Oak dominates guest rooms. Massive oak doors provide entrance, divide room space and close closets. Oak panels cover walls and stand in as bed headboards. The oak, combined with shades of grey carpeting and white linens, table tops and wall inserts, provide a restful pallet accented with splashes of stimulating color in woolen throws and decorative pillows. 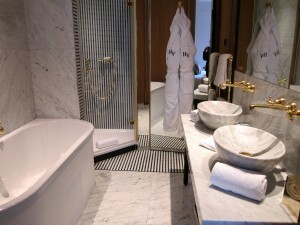 Bathrooms of wood and Carrere marble maintain the clean-line luxury theme. 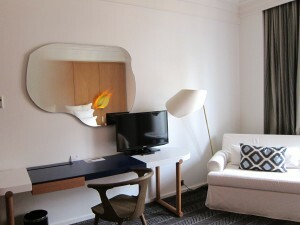 And in keeping with the five-star designation, Hotel Vernet’s guest rooms sport the latest technology, e.g., state-of-the-art flat screen T.V.s, coffee makers and dramatic futuristic brass bed lamps. 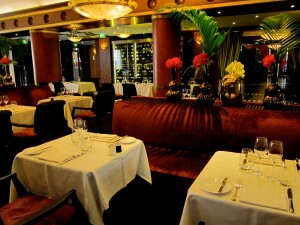 The haute modern Vernet attracts such guests as interior designers, fashionistas, hipsters and sophisticates. Three words to describe the vibe: trendy, hot, urbane.